Following a July 2018 visit, this post has undergone an update. Mallorca now boasts some excellent boutique hotels and if, like me, your favoured type of hotel is one small enough to ensure a high degree of personal service, you have plenty of choice on the island. 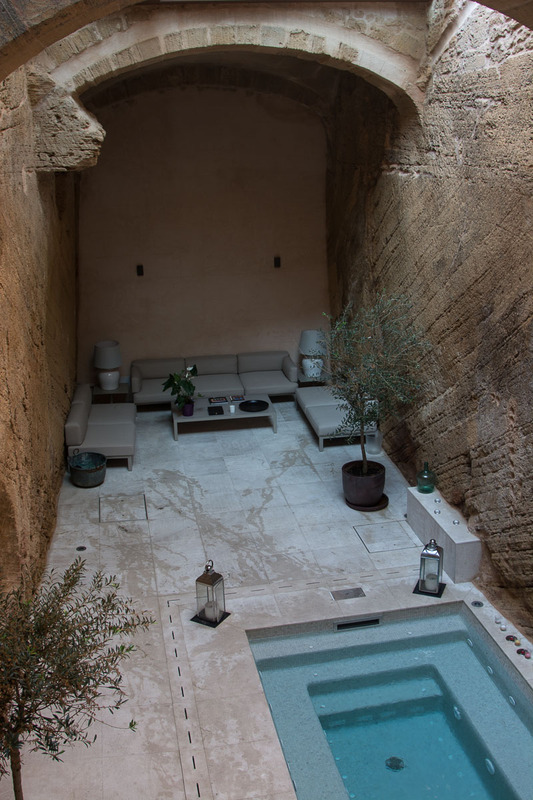 I stayed for a night at Mallorca’s Hotel Can Mostatxins, in the old walled town of Alcúdia. I’d been keen to experience the place since it opened in late spring 2015 – and I wasn’t disappointed. You can drive into the walled town to deposit your luggage, but it’s not far if you decide to park and make the short walk with your bags. Parking is easy – and free – just outside the mighty stone walls. 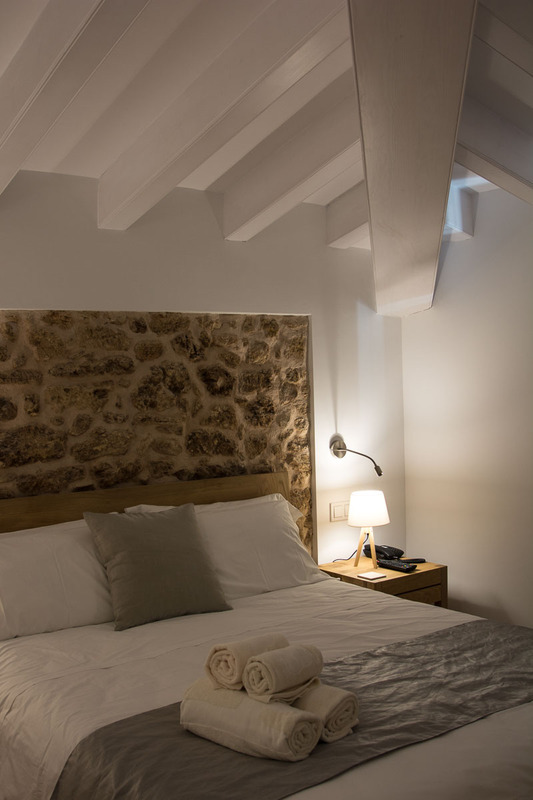 Hotel Can Mostatxins has its origins in a former 15th-century manor house, which had been neglected until British owner and property developer Mark Worthington came along. Turning the place into a stylish boutique hotel took six years, with many restored architectural features – such as Gothic arches and exposed stone walls – incorporated into the contemporary decor. And yes, it was definitely worth the wait. The hotel has nine guest rooms. Two – of which one is a stunning suite – are in the building’s restored tower. It was occupied when I stayed, so I didn’t see it – but it’s on my list of rooms in which to stay with The Boss in the future. My (very comfortable) bed for the night was in room 5, named Alcanada. The room had everything a travelling gal could need: safe; tea, coffee, and kettle; fridge (with complimentary water, milk, and bottle of cava – very welcoming); wall-mounted satellite TV; air conditioning; robe and slippers, and free Wi-Fi. And, for we girls who don’t like to go out with our skirts inadvertently tucked into our knickers (! ), there’s a useful full-length mirror on the back of the room door, so you can check all is as it should be just before facing the world. A unique feature of the hotel is the open central courtyard, below street level (and hidden from the outside world). It has a comfortable chill-out area and spa pool, where you can gaze up at the old stone walls – wishing they could speak and reveal stories from their past. Breakfast buffet-style is the only meal offered here, but the walled town of Alcúdia has lots of eateries and the hotel can suggest places to suit individual tastes. On both my two stays (the latest in July 2018), I have eaten dinner at Italian restaurant Osteria El Patio, just around the corner from the hotel. It’s popular so be sure to book a table – especially if you’d like to eat in the large rear courtyard garden. Mostatxins was the nickname (derived from the Mallorcan word for ‘moustache’ ) of the building’s former owner Raphael Aguilo Valls – a distinctively moustached man who ran a butcher’s shop from the premises in the early 20th century. You’ll spot a few moustache motifs around the hotel . . .
Valentina and Luigi are leading the hospitality team in 2018 – a year in which exciting things are happening for Mostatxins Boutique Hotels. The next building along is to become the new Can Mostatxins Frare – due to open its doors (and 11 rooms) to paying guests by August 2018. If you’re looking for a boutique hotel in Mallorca offering comfort, style, warm hospitality, and a sense of place and history, I can personally recommend a stay here in the delightful old town of Alcúdia. Wherever I lay my head . . .
Spa pool and chill-out area in courtyard of Hotel Can Mostatxins. ©Jan Edwards 2015. Some updates done in July 2018.